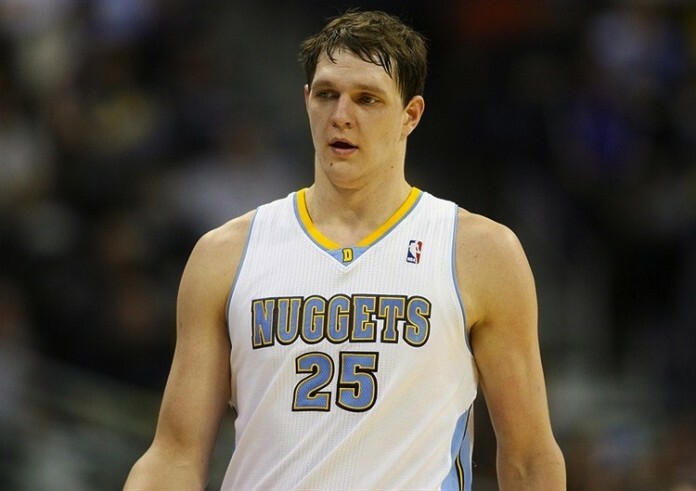 The Timofey Mozgov era is over in Denver. Wednesday, the Nuggets shipped away the 28-year-old center to the Cleveland Cavaliers for two protected future first-round draft picks. The Cavaliers will also receive a 2015 second-round pick from Denver. The first pick is one the Cavaliers acquired in a 2013 trade with Memphis, while the second pick Cleveland just received from OKC in the Dion Waiters deal. Protections on Cleveland first-round to Denver via OKC: 1-18 in 2015, 1-15 in ’16; 1-15 in 2017. After ’17, it becomes two seconds. We’ll put the nail in the coffin of the Mozgov’s time in Denver tomorrow morning, but right now, the deal looks like it’ll benefit both sides. The Cavaliers receive the center help and rim protector they’re so desperate for to mask Kevin Love’s defensive shortcomings, and the Nuggets, sitting at 15-20 heading into Wednesday’s game against the Orlando Magic, start to rebuild. Nuggets general manager and vice president of basketball operations Tim Connelly should be commended for getting two first-round picks for Mozgov. Mozgov is averaging 8.5 points and 7.5 rebounds per-game for Denver, and the team will definitely miss his defense at the rim, his underrated passing in the post and – most importantly – his familiarity with point guard Ty Lawson in the pick-and-roll. Under head coach Brian Shaw Mozgov truly flourished last season, establishing himself as a legitimate starting center in the NBA. But with a return of that size, the time was right for the Nuggets to move on. And the biggest boon perhaps from the Nuggets perspective is that the deal frees up plenty of playing time for rookie center Jusuf Nurkic, who’s looked lights-out in limited minutes with Denver this season. Again, we’ll dive into things more tomorrow morning, including a look back at some of Mozgov’s best moments here in Denver – but for now, it looks like the Nuggets started looking towards the future, while the Cavaliers got a little better today. And Mozgov, a fan favorite who really developed during his time here in Denver, might get a chance to win a championship. Zach Marburger is a staff writer for Mile High Sports. He can be reached via email at [email protected] or on Twitter @BurchBurger. For complete coverage of the Nuggets.